This is a great event for our students and graduate from all degree disciplines to find out more about the support available from Careers & Employability and to meet a great range of exhibitors all with graduate opportunities – that might just be what you’ve been looking for! Careers information and support and CV review available throughout the event. Hundreds of students attend – you can too. This event is held to support students and graduates with their career planning, particularly those who are graduating and don’t have any plans. The Fair is a fantastic opportunity to meet recruiters (as listed below), to take a closer look at your options and consider what you’d like to do with your future. You might find a job (or be offered an interview on the day – it does happen). Over 50 student & graduates recruiters have opportunities they want to recruit for. See the event programme on the day , read our blog Looking for graduate opportunities? 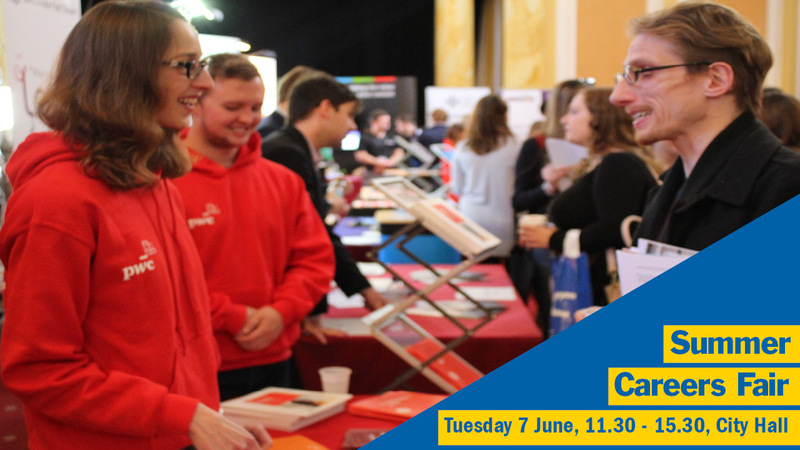 Find out who’s recruiting at this year’s Summer Careers Fair and follow us @Cardiffcareers on twitter for further details of who’ll be there, what degree disciplines they are recruiting from and the type of opportunities they offer. You can make lots of contacts. Even if there’s nothing that ‘jumps out at you’ on the day, you will have a great list of potential contacts and recruiters who are actively targeting Cardiff University’s students & graduates. Use their details to take a closer look at their websites and social media accounts to find out more about their organisations and the opportunities they have to offer. You can gain great advice and information. You have 4 hours to gain as much information and advice as you can. The recruiters exhibiting want to chat to you, to answer your questions and find out more about you. Ask questions about what they have to offer, what they are like to work for, what the recruitment process is like and any tips they have. Make the most of this time for face-to-face time interactions with recruiters – it’s rare and can be hugely advantageous. As well as chatting to recruiters face to face there are a range of talks you can attend to gain insights and tips from careers and recruitment professionals. These sessions are bookable via your Careers Account. How will I know who the exhibitors are recruiting? The best thing to do is to call along and ask them, many are recruiting from all degree disciplines and those who are targeting specific degrees are noted in the Blog Looking for graduate opportunities? 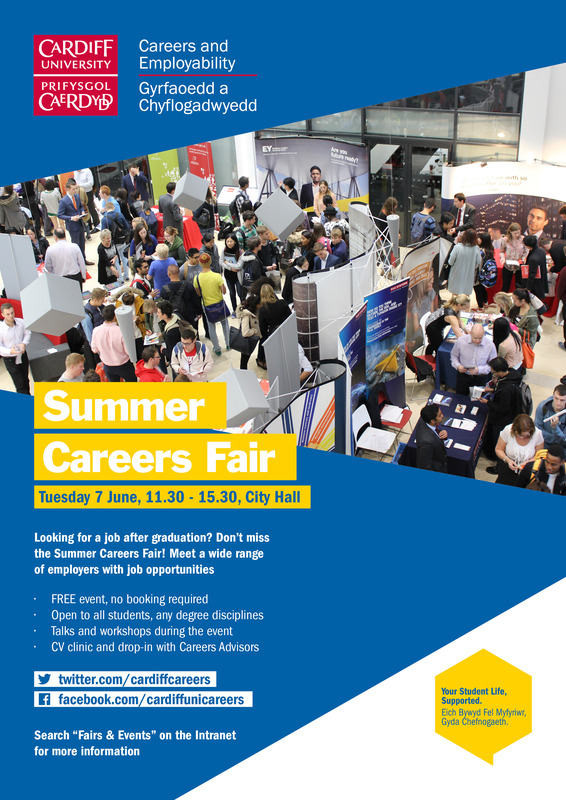 Find out who’s recruiting at this year’s Summer Careers Fair and also in the Event Programme you’ll be handed when you arrive. Any tips you can offer me on meeting recruiters? What if I can’t make it to the Fair? Drop-in at The Student Support Centre, 50 Park Place (Student High Street) and Cardigan House (Heath Park campus), or find us the Intranet, to access our full range of support and information. Follow our #before you graduate campaign @Cardiffcareers on twitter and read our blog Get career ready #beforeyougraduate! You are welcome to attend other University careers fairs across the country.